We check in with 2016 KiwiGameStarter winners Team Ninja Thumbs and their multiplayer brawler Grabity. Almost everything about making games is hard, and that includes summing up your creation in a single sentence. For obvious reasons, PR companies tell devs to avoid using established titles as points of comparison, but such a rule ignores the way gamers talk about games, as well as the way games are made. Besides, as Team Ninja Thumbs' Moritz Schlitter says, every game is a remix – you can't escape your influences. 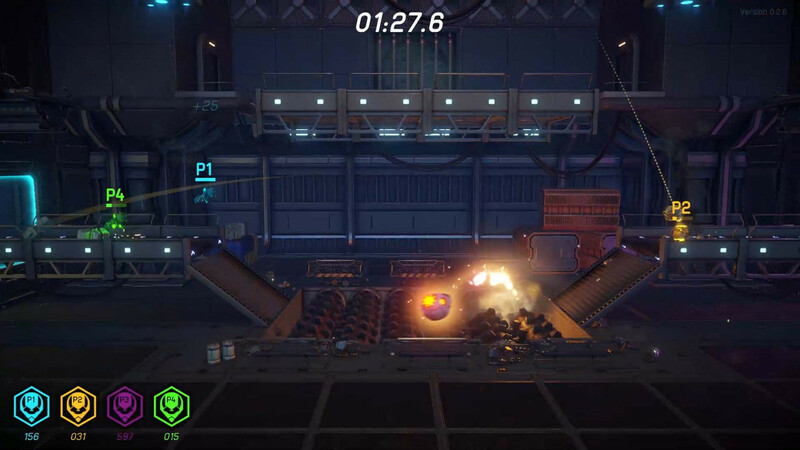 That's why Grabity is officially known as a physics-based robot arena brawler, but Schlitter refers to it as "Super Smash Bros. with Half-Life gravity guns". His colleague Steve Salmond prefers the phrase 'robotic food fighting', "but I don't know if Mo likes that one!" he quickly adds. Whatever you call it, you'd be hard pressed to say that Grabity isn't shaping up nicely. 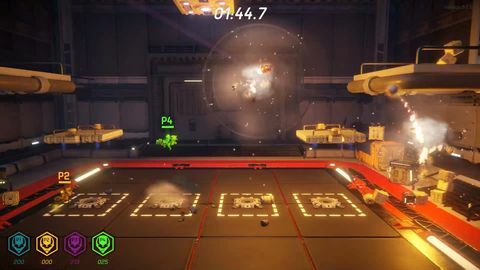 A 2-4 person local multiplayer title, it's a twin-stick, easy to learn / hard to master arena brawler with three game modes, a bunch of special items and cosmetic upgrades, and side-on 2.5D gameplay fully rendered in 3D with real-time lighting and physics. Team Ninja Thumbs' Moritz Schlitter and Steve Salmond. "I guess I've just always loved games and always wanted to make them… It's always been a dream"
Halo and Rocket League are both influences in their own way, alongside a mix of games the pair have played. Despite that melting pot, it was part iteration and part slight accident the way the gameplay was discovered, says Salmond: "I guess we were hoping to create something that's really fun to sit down on a couch with a couple of friends and have a good time." Salmond and Schlitter met working at Outsmart Studios in the ritzy Auckland suburb of Parnell. By that time, Salmond had already been there for a number of years as part of the core team that started Small Worlds, a game that went on to be a big hit for the studio. Prior to that, he had worked at Virtual Spectator, a Kiwi company that produced the pioneering graphics for TV you used to see on America's Cup and World Rally coverage. However, gaming and coding were his passions. "I guess I've just always loved games and always wanted to make them… It's always been a dream," he says. Schlitter, an artist and animator, arrived in Aotearoa from Cologne, Germany nine years ago. He put some time in at a "very unknown, very unorganised" indie studio, then managed just a single year at Media Design School before leaving in frustration to teach himself art and animation via YouTube. A start-up job later and he was at Outsmart, where he and Salmond immediately gelled. "We both liked the same games," says Schlitter. "We played games together, and we have the same type of humour when it comes to playing games." In his spare time, Schlitter was working on art for Goblins of Elderstone, but Salmond committed the pair to doing a game jam every month anyway. The pair's easy camaraderie saw a coder/art split naturally emerge, and the twosome understand each others' strengths well. "He's quite a good artist as well, and it's very uncommon for programmers to be good at art," says Schlitter, who contributes concept art, modelling, rigging, and animation to the project. "The good thing is we both have opinions on each other's areas, but we wouldn't infringe on them." Ambition often outshone production bandwidth though, with the pair always drafting up games far beyond the scope of a two-man team. To combat this, it was agreed that their next jam game would be a single-screen affair, and thanks to this restriction, a rough sketch of Grabity emerged. 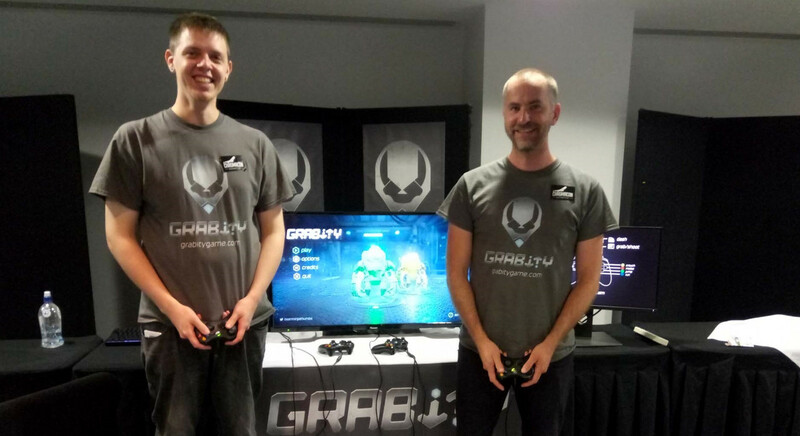 "It's very hard to get people to look at your indie game"
At the time, Rocket League and Halo 4 were the games of choice during lunch breaks at Outsmart, but the pair twisted their co-workers' arms to get them testing Grabity. "They seemed to enjoy it after a couple of weeks," says Salmond. "Grabity was our new lunch game for a while." Seeing their colleagues having fun with the game gave Salmond and Schlitter motivation to keep working on it, but when Salmond left Outsmart last year, his focus shifted to a film project. Still at Outsmart, Schlitter entered the game in the 2016 KiwiGameStarter competition, and when it took top honours, Schlitter left Outsmart and the pair decided to knuckle down and get the game released. The slightly-more-than-a-year that Grabity has been in development has been positive, but Team Ninja Thumbs readily admits their lack of business focus has been their biggest hiccup. "I like doing art and I like doing game design, and Steve likes coding and game design, so when we meet up we just play our game and develop our game, and we never do anything to advertise ourselves," Schlitter says. Salmond agrees: "We're just super focussed on making a fun game I suppose, and we're learning the other skills we need to succeed as we go. I don't think we're alone in that!" The pair are wary of promising anything, but they are looking into online multiplayer to see if it's possible to implement. There's also the fact that console feels like a natural fit for the game, but it's still too early to make that call. Whatever happens, they are hoping for a full release to Steam in the third quarter of this year. "We just wanna get the game into a state where we'd be happy to purchase it," says Salmond. 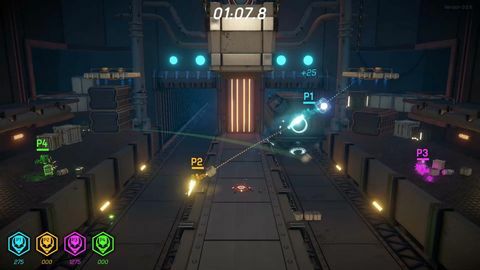 Grabity was Greenlit in May, and among the things added since then are AI opponents that can be used for practice or single-player fun. Now one of the bigger problems ahead appears to be exposure. "It's very hard to get people to look at your indie game," Schlitter laments. Even so, the pair agree it's a really good time to be in indie developer in New Zealand. "Maybe it's just the last year that I've been in it, but I've noticed how much New Zealand is trying to push the indie scene up," says Schlitter. Salmond concurs: "The NZGDA are doing some really good work, and the conferences that are springing up are really cool. There's a lot of people putting a lot of hard work into growing the industry. It's really cool." ◆ You can follow Grabity on Steam here, and Team Ninja Thumbs on Twitter here.